Gov. Bill Walker's announcement on Friday that he was suspending his re-election campaign turned the Alaska governor's race on its head with just two-and-a-half weeks until Election Day and early voting starting Monday. A three-way race that left some voters fretting over whether to support Walker, an independent, or Democrat Mark Begich, is now a much clearer head-to-head fight to become the next governor in red-state Alaska. It's Republican Mike Dunleavy, a former state senator from Wasilla, against Begich, a former U.S. senator and Anchorage mayor. Walker dropping his bid for re-election has sparked renewed enthusiasm among Democrats, with some seeing a clearer path to victory for Begich now in a two-way race, said Jay Parmley, executive director of the Alaska Democratic Party. "There is an enthusiasm that this is doable," Parmley said on Saturday. "It's not excitement that Bill Walker has dropped out. It's really, 'Gosh, this is doable and we want to be part of it.'" Walker, a Republican-turned-independent, was elected in 2014 on a so-called unity ticket with Byron Mallott, a Democrat, and is the only governor in America not elected as either a Republican or Democrat. Walker and Mallott remained locked in their re-election campaign until this past week. Mallott, who Walker has called his closest friend, abruptly resigned from office and stepped away from the re-election campaign on Tuesday after making unspecified "inappropriate comments" to a woman. Three days later, Walker dropped out of the race, and threw support to Begich. Walker said he had talked to many Alaskans and determined Begich had a better chance of winning in a race against Dunleavy. While there are a lot of things he disagrees with Begich about, Walker said, he'd still be better for Alaska than Dunleavy. The timing of Walker and Mallott quitting the race complicates voting. Though they're no longer running for re-election, it's too late to take them off the ballots, which have already been printed. Voters will see their names there alongside Dunleavy, Begich, Libertarian candidate Billy Toien and their running mates. What's more: Some Alaskans have already voted. As of Friday, the Alaska Division of Elections had sent out 23,773 absentee ballots, and Alaskans had voted and returned 3,076 of them. The division did not have information on Saturday about the implications of Walker dropping out on voting, including what it means for voters who may have already sent in their absentee ballots and voted for the Walker-Mallott ticket. Samantha Miller, division spokeswoman, said in a text message Saturday, "We are still processing everything and will have more information on Monday." After Walker's announcement on Friday, his campaign team was busy fielding incoming Facebook messages and calls, said campaign manager John-Henry Heckendorn. He saw "messages of trust" on Facebook, he said: "that if (Walker) believed that was the right thing to do, it probably was." Staffers also convened a statewide call with coordinators and volunteers to explain what happened. "Campaign phone was blowing up," Heckendorn said. "Clear out the voicemail inbox and half an hour later it was full again." 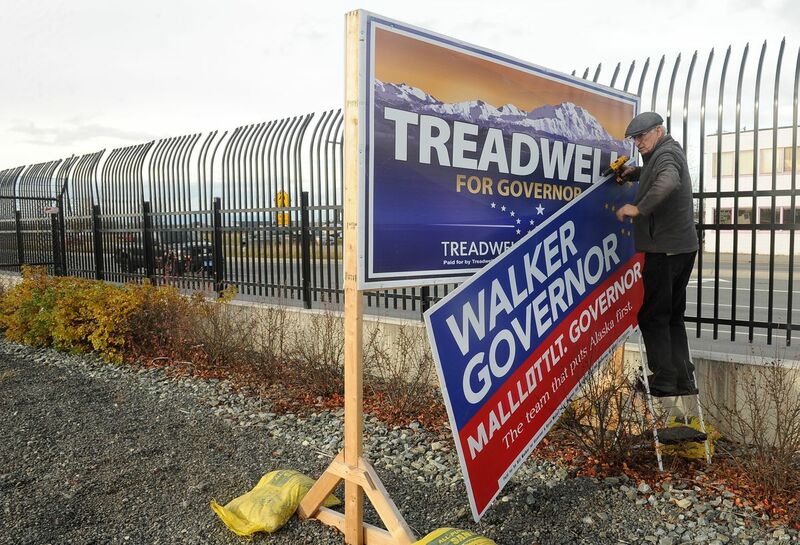 On Saturday, volunteer crews were out taking down the big Walker-Mallott campaign signs scattered across Anchorage. The campaign has stopped accepting donations and staffers have to figure out how much money the campaign has left and what it's allowed to do with those funds, Heckendorn said. Given how late it is in the election cycle, "it's not like we're sitting on a big stack of money," he said. The campaign is "figuring out logistically and legalistically what the order of operations is for standing things down before the election," he said. Part of that involves what the Walker campaign will do with the advertising time it has already bought. "If we can get our money back, if we can sell it to somebody else, and that kind of thing," Heckendorn said. Walker-Mallott signs on the sides of city buses that roll around Anchorage are set to be removed on Sunday, he said. Asked what he personally was going to do next, Heckendorn said: "I'm going to go take signs down." 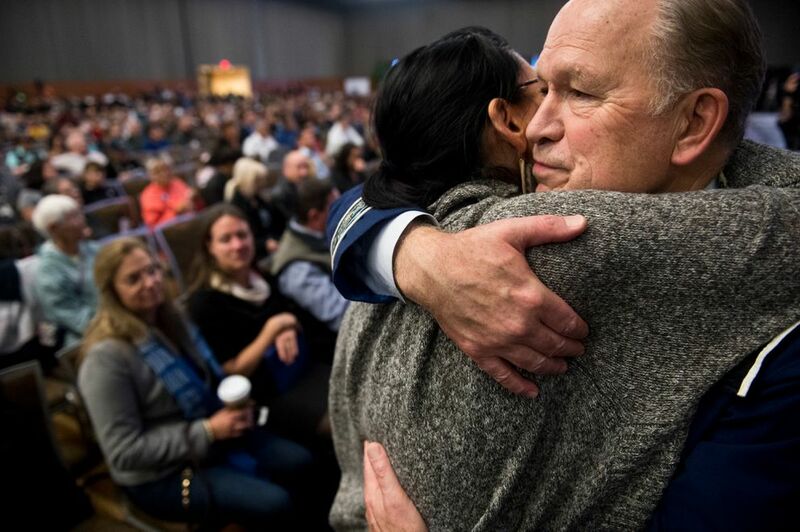 For some voters, the choice was clear after Walker's announcement, which he delivered in an emotional speech at the Alaska Federation of Natives' 52nd annual convention. Andrew Halcro, a former Republican state representative and executive director of the Anchorage Community Development Authority, was planning to vote for Walker and said now he is "definitely" voting for Begich. He thinks the majority of people who were supporting the governor's re-election will likewise migrate that direction. "The deal with Walker and Begich — you kinda like both of them," he said. "For me, Walker is a leader and he's made tough decisions no other governor has had the guts to make." A cornerstone of Dunleavy's platform is restoring a full Permanent Fund dividend to Alaskans, after Walker reduced the annual oil-wealth payouts. Halcro worries that a Dunleavy governorship would grow Alaska's budget deficit. The stakes are high, Halcro said. "If the state is ever going to grow and move out of this boom-and-bust mentality," he said, "this is a defining moment." Alaska Republican Party chairman Tuckerman Babcock said Saturday he thinks it's not so clear-cut that groups that had endorsed Walker, such as labor organizations and Alaska Native corporations, will flock to Begich. "Democrats' response has been, 'OK, now we can add Walker's number to our numbers and now we're running an even race,' and that's not gonna happen," he said. Some groups that had supported Walker are still deciding what's next. It's not clear yet what the governor's announcement means for Unite Alaska, the independent expenditure group that formed in support of his re-election. Independent expenditure groups can't coordinate with campaigns, but they can raise unlimited funds from individuals and organizations. Unite Alaska had raised more than $1 million on behalf of Walker, according to state filings. In response to emailed questions Saturday about what happens to the money Unite Alaska has raised, a spokesman sent back a short statement from group co-chair Barbara Donatelli: "No decisions have been made." The Alaska AFL-CIO, the largest labor organization in the state, had formally endorsed Walker in August. President Vince Beltrami did not return a phone call Saturday about what the organization will do now. Walker's announcement Friday won't mean a change in strategy for the Dunleavy campaign, spokesman Daniel McDonald said. "The campaign is still full steam ahead and nothing is changing," he said. Begich is keeping his schedule of upcoming debates and forums, said Nora Morse, his campaign manager. She said the campaign is reaching out to the event hosts to reaffirm their attendance and their desire to speak to those groups, even if some of the debates are cancelled in instances where only Begich and Walker had agreed to go. Meanwhile, the Alaska Democratic Party is starting a big push to get out the message that Walker is out of the governor's race, Parmley said. He said they'll use "every means available," including phone calls, text messages, door knocking and social media posts to ensure people know that even though Walker's name is on the ballot, he is no longer in the race. "If someone intended to go vote for Bill Walker, but will now vote for Mark Begich we want to make sure they know that before they walk into the ballot box — that's really important," he said.